Length The shell diameter may reach 6 cm. Description The Common Limpet is a herbivorous marine snail living along the rocky shores of Western Europe. 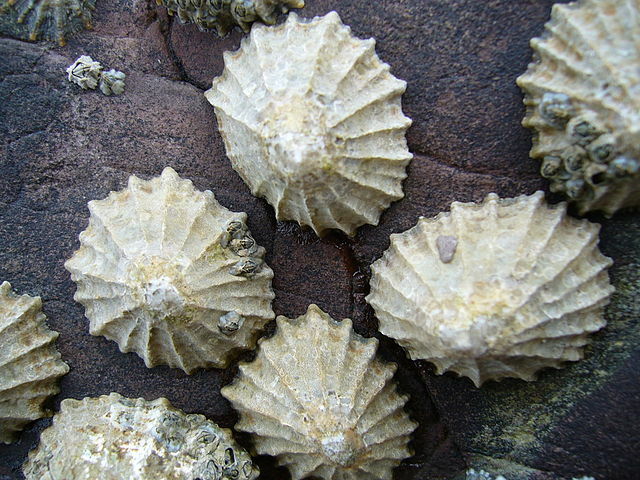 Shells have distinct ridges radiating from the top. On locations exposed to strong waves the ridges may be invisible. They are grinded away by stones in constant movement. Shell exterior is usually grey, with a tint of yellow. Interior is usually greenish grey. Habitat It thrives on exposed, rocky locations from the high tidal zone and shallow subtidal zone.